Prineville Reservoir is located in the beautiful high desert country of Central Oregon, just 50 miles east of Bend. Anglers can fish for trout year round, including ice fishing during the winter. The reservoir has a variety of fish including trout, bass, and crappie. 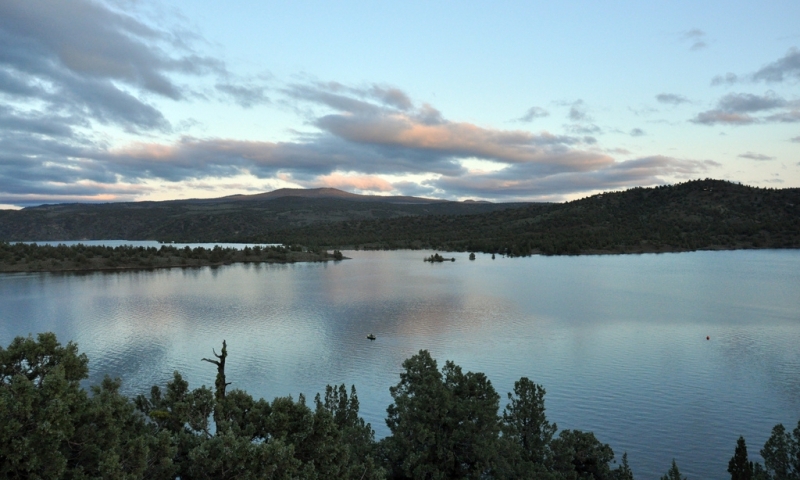 Beautiful high desert scenery surrounds the reservoir. A variety of wildlife, including several types of raptors, inhabit the area. Prineville Reservoir was created several decades ago when the Arthur R. Bowman Dam was built on the Crooked River in Central Oregon. Juniper and sagebrush line the shores of this high desert reservoir located about 29 miles east of Bend. Fishing is a popular activity here all year round, as anglers can ice fish for trout in the dead of winter. A variety of beautiful wildlife including elk, deer, fox, and a variety of raptors add to the scenery of Prineville Reservoir, Oregon. Prineville Reservoir, OR, is located about 50 miles east of Bend. The best route is highway 97 north to Redmond, then 126 east to Prineville, then south on SE Juniper Canyon Road. Fishing – Avid anglers will find rainbow trout, cutthroat trout, crappie, bass, catfish, and crayfish in the reservoir’s waters. Ice fishing is popular from December through February. Watersports – With no restrictions on boat speeds, watersports are popular at this reservoir including waterskiing, tubing, and wakeboarding. Bird Watching – Be sure to bring your binocular to view a variety of raptors including bald eagles, golden eagles, red-tailed hawks, prairie falcons, and osprey. Other interesting birds in the area include chukar, ash-throated flycatcher, and black-throated gray warblers. Wildlife Viewing – An array of wildlife inhabits this area, including gray fox, red fox, black bear, lynx, elk, deer, pronghorn antelope, and badgers. Watch for rattlesnakes during the warmer months, as they are very common in this part of Oregon. The reservoir has 3,000 acres of surface water and an elevation of 3,200 feet. Prineville reservoir stretches along 18 miles of the scenic Crooked River. Used for irrigation, the water levels can vary significantly. Designated as a wildlife management area, the northeast end of the reservoir offers a refuge for a variety of wildlife.